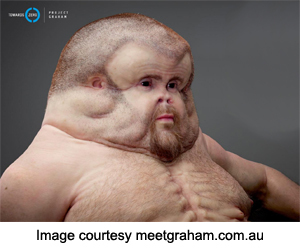 Meet Graham, a conceptual art piece developed by artist Patricia Piccinini and the Australian safety group, Towards Zero. Graham is a portrait of how we would look if we evolved protective features to reduce the effects of car accidents on our bodies. Graham serves as a reminder of just how fragile the modern human body is when encountering severe forces in a traffic collision. While today's vehicles evolve and improve every model year, the human body has changed very little since the invention of automobiles. The team behind Graham included trauma surgeons and road safety engineers who see firsthand what a serious car accident can do to our fragile bodies. Working with past accident examples, the experts worked with Piccinini to create a human body that would withstand common car accident injuries. When compared to the current human structure, Graham is different from head to toe, yet somehow still familiar. Starting at his head, Graham's brain is identical in size to ours but has an extra cushion of cerebrospinal fluid and anchoring ligaments to prevent the brain from striking the inside of the skull during a collision. Graham's skull offers a second layer of protection; it is much larger than our skulls due to "crumple zones" that absorb energy created by the sudden stop of the vehicle. Moving down, Graham lacks one of the most easily injured parts of the body: the neck. His lack of neck removes the risk of whiplash and damage to the cervical spine. An extended ribcage helps anchor Graham's head and his shoulders from moving violently during a collision. The human rib cage already serves as great armor for our internal organs, but Graham's is far improved. The ribs are thicker and harder to break. Cushioned sacks between the ribs act like airbags to absorb some of the force in the collision and prevent too much bending of the ribs. The team also enhanced Graham's arms and legs to reduce injury, starting with the skin. A thicker layer of skin helps Graham avoid severe road rash and better tolerate burns. His knees are multi-directional, rather than one-directional like our knees. This extra range of motion prevents knee breakage when the joint hyperextends or bends. Finally, the team designed Graham's feet to work like a hooved animal’s, allowing more spring and agility. This feature not only helps Graham to avoid oncoming cars as a pedestrian, but it also reduces stress on the tibia bone and helps prevent fractures. Graham serves as an example of the most vulnerable parts of our bodies and the safety precautions we must consider when driving, biking, or walking. While we cannot evolve to develop Graham's traits, we can improve our safety by always wearing our seatbelts, using a helmet on bikes and motorcycles, and driving safely at all times. For more information on car accident injuries and help with recovering after a car accident, contact Max Meyers Law. We offer free, no-obligation consultations regarding your right to recovery after a traffic accident. Call 425-399-7000 today.